In a large skillet over medium heat, cook the bacon until crisp and brown, about 5 minutes. Using a slotted spoon, transfer bacon to a paper towel to drain. Pour bacon drippings into a medium bowl and set aside. Bring a large pot of salted water to a boil over high heat. Add peas and cook until barely tender, about 2 minutes. Remove from water and transfer to medium colander (keep water boiling). Repeat with fiddleheads, cooking, about 4 minutes. Remove from water and add to colander (keep water boiling). Rinse peas and fiddleheads under cold water and drain. Add pasta to water and cook according to package directions until al dente. Drain and transfer to a large serving bowl. 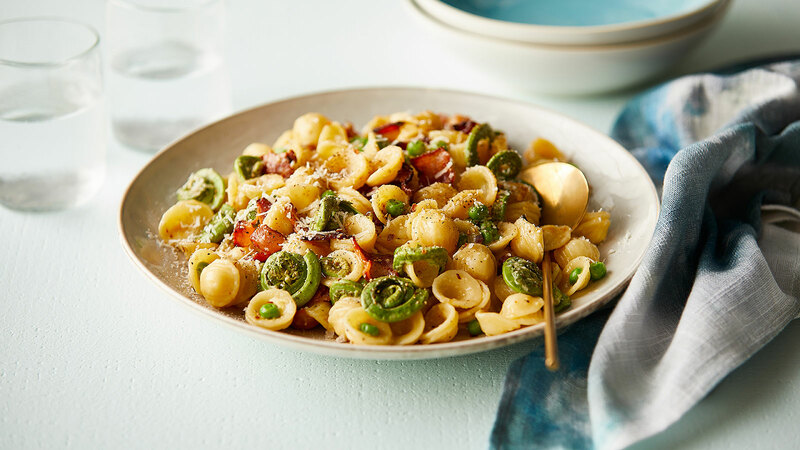 Add peas and fiddleheads to pasta. Add eggs, cheese and a few grinds of pepper to the bacon drippings. Stir to combine. While tossing pasta with tongs, pour over egg mixture. Add butter, season with salt and pepper and toss until butter melts and all ingredients are coated with sauce. Sprinkle with herbs and reserved bacon and serve immediately with more cheese on the side.